We’d like to take you back to a time earlier this year. That time is January. Are you there with us? Wonderful. Remember all of those resolutions you made? Perhaps they were to eat more greens, make more homemade meals or try something new? Well don’t fear, it’s never too late to make a change. Even one small change, like adding a new green into your diet, can change everything. 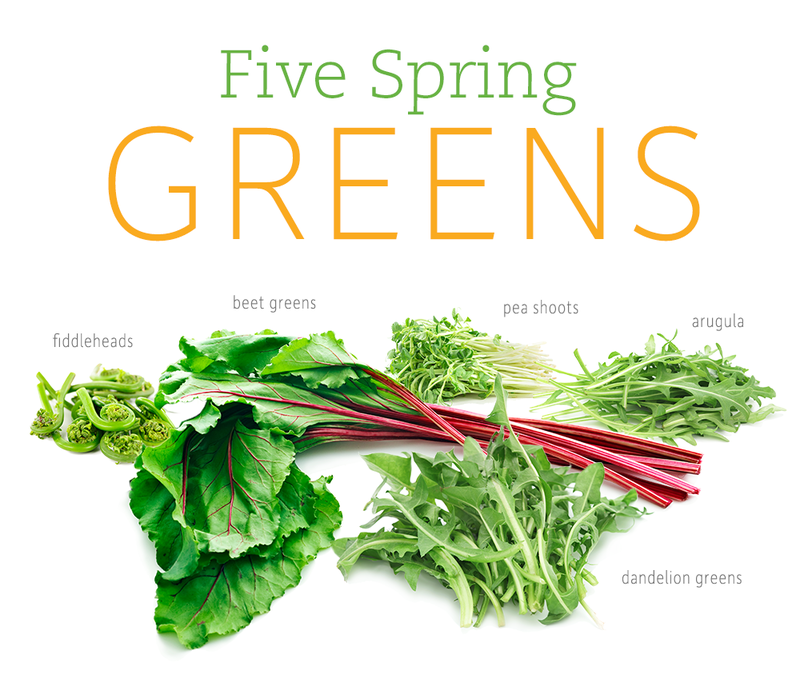 With that in mind and a resolve to try something new let’s talk about how you can expand your greens menu with one (or all) of these five greens. There’re more ways than you know to incorporate dandelion into your diet; while bitter they’re quite versatile. If you’re trying them for the first time try adding them to a smoothie or juice with some fruits such as pineapple or banana to balance the bitterness of the greens. Steaming is another option because removes some of the bitterness. If you’re going to enjoy them in a salad we recommend a splash of lemon juice. Beets are sweet and so are their greens. Instead of tossing your beet greens into the compost toss them into a smoothie like this whole beet smoothie instead. You can also toss them in some extra virgin olive oil and sauté or add them to a vegan pesto. Arugula has a slight sweet and peppery taste that lends itself well to other greens which is why you’ll often find it in pre-made lettuce mixes. Save yourself time and from that last minute crunch to get lunch with arugula in a Mason jar salad. If you’re looking for ways to add turmeric into your diet too try it in a dressing, drizzled on this arugula harvest salad. Fiddleheads are best enjoyed cooked, sautéed or steamed. As easy way to enjoy them is just as you would asparagus, sautéed and lightly seasoned with a splash of lemon. You can also throw them into a springtime farmer’s market stir-fry similar to this one or in a green soup. Pea shoots (or pea greens) are light, delicate and tender. They’re ideal for adding a light texture to salads, sandwiches and rolls. They can also be added to noodle bowls and stir-fries like the one above. Overall, green smoothies are hands down the easiest way to expand your greens menu. You can substitute any of the greens above in your favorite green smoothie. Go ahead, play around in the kitchen and resolve to try something new. If you’re looking for some green smoothie inspiration check out this Ultimate Green Smoothie and this Apple Kale Green Smoothie.